The first thing you should take into account before buying new furniture for your sunroom is the durability as the furniture will permanently expose to heat, cold and rain. You should opt for furniture that lasts for a long time and it should require minimum efforts for maintenance. Therefore, if you are seeking durability, then teak wood furniture is your choice as it is a highly durable material. To create a living room atmosphere in your sunroom, then traditional upholstered furniture with soft cushions is worth consideration. 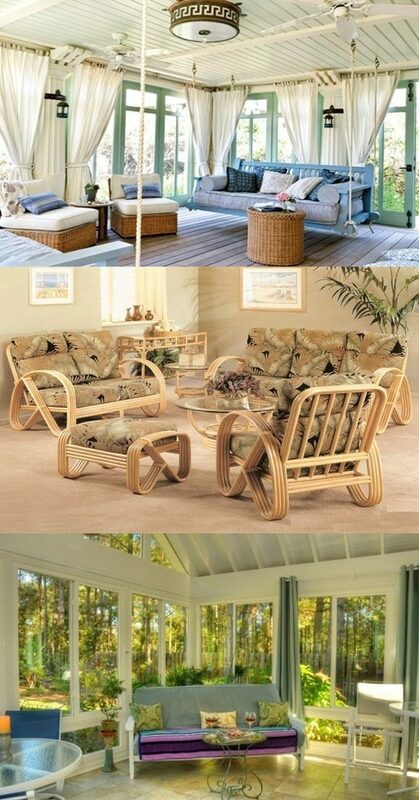 If you want to add an aesthetic and functional touch to your sunroom, then you should go for rattan furniture. Rattan furniture can be easily moved to other positions. If your sunroom is exposed to extremely cold weather, then you should use metal furniture as it is basically made of aluminum, cast iron or wrought iron. If you got metal furniture, then consider coating it with PVC in order to protect it from corrosion. For a comfortable sunroom, opt for wicker furniture as chairs, sofas, armchairs made of wicker are very comfortable to sit on. Take into account, wicker furniture requires regular cleaning. To create a relaxing ambiance in your sunroom, consider placing some cozy rugs on the floor and large throw pillows. A small coffee table in the center of your sunroom will add a character to it. The following breathtaking pictures illustrate clearly how you can benefit from these top tips on sunroom furniture.